His brain isn’t all that’s coming along; she’s also growing other integral organs, such as a heart and kidneys. In fact, he likely has a heart rateof about 100 beats per minute at this point. Additionally, your baby may be developing a tongue, arms and legs. Toward the end of your seventh week, your child is nearly double the length he was at the beginning, reaching roughly 13 millimeters, with the head making up the majority of the volume. Even though your baby is no bigger than a berry at seven weeks, you may begin to feel pressure on your bladder. This isn’t only due to your expanding uterus, but also an increase in a hormone called human chorionic gonadotropin (HCG), which helps to get blood flowing to yourpelvis. This is a good thing, because blood flow stimulation allows you to better get rid of waste, and HCG plays an integral role in placent development so just try to remember that the next time you’re racing to the bathroom. You may also keep in mind that some women experience alleviation in their constant need to go once they enter their second trimester. But it also may reappear toward the end of your pregnancy when your little one settles down into your pelvis, leaving not much space for your bladder. What’s important to remember is that even though your urge to urinate may seem intense and never-ending at times, don’t try to cut down on time spent in the bathroom by forgoing fluids. You and your baby need to remain hydrated, and a lack of fluids may cause a urinary tract infection, which is most unpleasant. Your baby’s brain is growing, his eyes and nostrils are forming, and his arms and legs look like small fins with bumps on the ends. Eventually these bumps will develop into fingers and toes. The main air passages of your baby’s lungs have formed and so have the left and right chambers of his heart. In fact, his heart has started to beat with enough strength to carry cells through his blood vessels. Your baby is currently nestled in the lining of your uterus and some of the cells in the lining are forming the placenta. Once the placenta is fully developed, it will look like a slab of beef liver. It will start to maintain your pregnancy by transmitting nutrients and oxygen from your blood to your baby through the umbilical cord. Until then, your own body and hormones are on the job. You’re not alone. Many women feel very tired in early pregnancy, because it takes lots of energy to create a baby. In fact, fatigue is often one of the first signs of pregnancy. So go easy on yourself and make sure you get enough rest. Chances are you’ll start to feel less tired around Week 12, when the placenta is fully formed. At 10,000 times larger than at the time of conception, your baby now measures approximately 13-18 mm. In fruit terms, your baby is now the size of a blueberry. 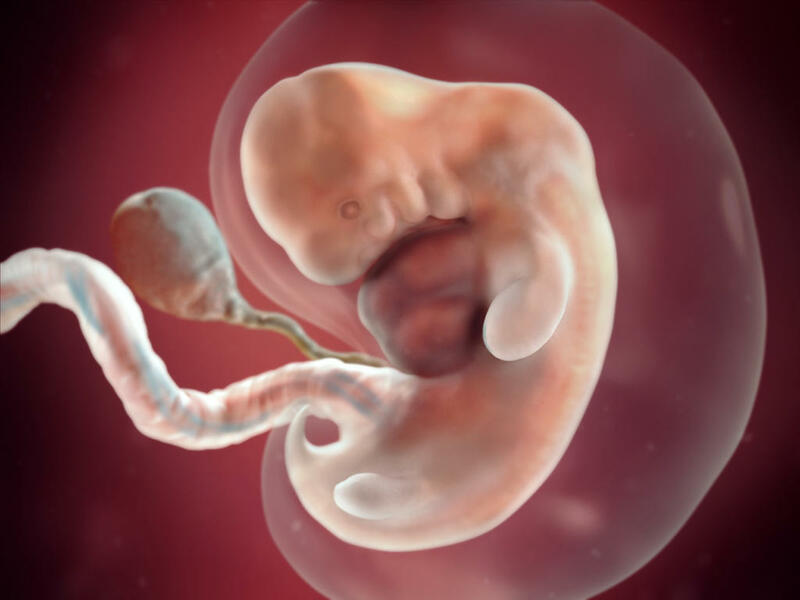 The embryo has distinct, slightly webbed fingers and toes. It is a jumping bean, moving in fits and starts. Call your doctor if you are experiencing symptoms of an ectopic pregnancy or miscarriage such as vaginal bleeding or passage of tissue, leaking vaginal fluid, feeling faint or dizzy, low blood pressure, rectal pressure, shoulder pain and severe pelvic pain or cramping. Your baby is already developing amazingly distinct facial features. Dark spots mark the areas where her eyes and nostrils will be, and a little mouth and ears are starting to form, too. Your baby’s brain is also growing more complex. if you could take a peek, it would be clearly visible inside the transparent skull. In fact, nerve cells in your baby’s brain are growing at an amazing rate 100,000 cells per minute! And she’s started to move in small, jerky motions, although you won’t feel these movements until about your fourth month of pregnancy. Blood work such as blood type, Rh factor, iron levels and possibly genetic and ethnicity related genetic disease testing, German measles immunity, etc. Urine testing to evaluate for glucose (sugar), protein, bacteria and red and white blood cells. You will soon find out that there are many lifestyle modifications that need to be made during pregnancy and even after delivery. During pregnancy, you will need to take care of yourself and your developing baby. Be sure not to drink alcohol or smoke during pregnancy, and avoid all other toxic substances such as drugs during this time. Be sure to discuss all medications you are taking with your health care provider to ensure that you should continue use during your pregnancy. To nourish yourself and your baby, make sure you eat a healthy diet and take a good prenatal vitamin. Another way to maintain your health during pregnancy is to get 30 minutes per day of exercise such as yoga, walking or swimming.5 Speak with your health care provider about your current or desired exercise regimen to make sure it is safe. Everyone wants to look their best but using permanent hair color is not recommended during the first 12 weeks of pregnancy; instead consider using a semi-permanent dye. While it is safe to eat fish during pregnancy, it is recommended that you limit your intake to 8-12 oz. of fish and shellfish per week. Some examples of fish that are safe to consume during pregnancy include shrimp, canned light tuna (note: mercury varies can to can), pollock, catfish, salmon, anchovies, herring, sardines, trout, Atlantic and Pacific mackerel and cod. If you plan on eating albacore tuna and tuna steak, it is recommended to limit consuming this fish to 6 oz. per week. Most importantly is to avoid eating shark, swordfish, tilefish and king mackerel while pregnant, as they have high levels of mercury, which can be harmful to your baby’s brain and nervous system.